We’re now taking In-app Billing further by adding another important business model — subscriptions. Starting today, developers can use In-app Billing to sell monthly or annual subscriptions from inside of their apps. 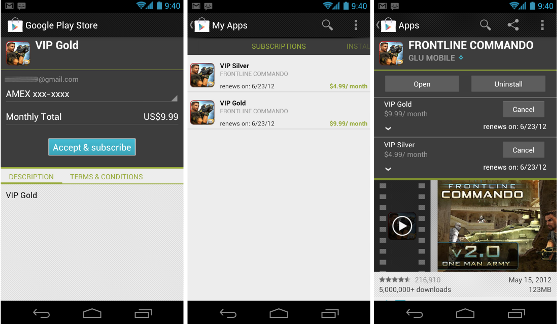 All subscriptions are auto-renewing, for every app and game and every type of subscription product. Developers just set the price and billing interval and Google Play manages the purchase transactions for them, just as it does for other in-app products and app purchases.